Are you thinking of creating an online store that deals with electronics? Do you wish to present electronic gadgets and devices in an appealing way without losing much time? Do you believe that a customized website can be quite costly? Do you wish to save as much money as possible? If your answer is ‘yes’, this article will be helpful for you. So, you need a website to sell electronics online. Sure, you can have a website crafted specially for you, but the work of web developers and designers may cost you a big sum of money. In this case, pay attention to a much more affordable option – creating your own website with the help of a ready-made theme. Shopify themes have been developed specially to suit the needs of various online stores. Precisely, there is a huge collection of electronics Shopify themes that are devoted to electronic goods. Why should you use electronics Shopify themes? First, they have been developed by professionals with regard of the business niche. Thus, you may be certain that your online store will have the best look and productivity. You can compare themes and choose the design that you find most appropriate. Second, these themes are much cheaper than creating a customized website. Third, the themes are easy to launch and adjust to your needs. Hence, your website will look personalized the way you see it. How should you choose a theme? What you need to look at is the theme’s design and functionality. An incredible variety of designs will undoubtedly give you a chance to cheese the one you find most attractive. Afterwards, try to determine which functions are prioritized for you comparing different themes. Built with Bootstrap 4, this theme features 6 pre-made home pages that will let you display various electronics products, including smartphones, cameras, drones, or even refrigerators. Different shop layouts (Grid, List, Single Product) are designed to arrange information to attract customers’ attention. The theme’s functionality is ensured by numerous widgets, gadgets, and other features that turn shopping into a pleasant experience. They include Mega Menu (with images) to organize products into categories, Product Badges and Stickers, Quick View, Product Review, Wishlist, and so on. Also, social options let people share information via networks in a couple of seconds. Suitable for online stores selling sound devices, such as speakers and headphones, this stylish theme will enchant you both with its look and its functionality. Besides Mega Menu and Collection Catalog, it offers a lot of effective ways to showcase products, such as Sliders and Carousel, Lookbook and Scrapbook Sections. Your customers will definitely appreciate the function of sorting search results by different criteria, as well as adding their favorite products to the Wishlist. Moreover, you can run a blog and add Testimonials to your website to increase its credibility. Besides, the theme is multilingual and multicurrency, so international trading is also possible with it. Being trendy and dark, this theme emphasizes the look and functionality of different electronic products, particularly cameras and their accessories, lighting and power supplies. A variety of the ways to present your goods is really impressive, as you can create slideshows and product carousels, add images with text or images with text overlay, divide your text into columns, and many more. Sorting options and Product Quick View will also facilitate the customers’ navigation through the website. To delight your customers even more, you can add a fascinating Parallax effect that creates the feeling of full immersion into the site. This light and smart theme is appropriate for stores selling mobile phones, mobile accessories, screen protectors, chargers, or sound systems. The shop pages with a grid, list and single product views will help you organize important information efficiently. Product Popup, Quick View, Related Products, Featured Products and other useful features are aimed at grabbing customers’ attention. Additionally, if you prefer other color schemes, you can easily adjust color options, and you can also experiment with embedded Google Fonts to achieve the best view. Furthermore, Newsletter Popup, Contact Information, Post and Product Shares will guarantee your connection with your clients, and your website’s promotion in social networks. Designed in green and white colors, this attractive theme will be appropriate for numerous electronics products, such as sound devices, video game consoles, mobile phones, home security systems, and many more. Create eye-catching catalogs with images, present your goods in collections, run a blog about your items, and present customers with multiple opportunities to contact you with the help of this theme. You can make a special accent on brands that you’re selling, emphasize bestsellers and popular products, advertise sales and new arrivals. Surely, your customers will enjoy shopping due to user-friendly buttons for choosing product variants and adding items to the cart. Developed especially for online stores selling mobile telephones, the theme will provide you with multiple layouts and sections to organize your store efficiently. Stunning galleries, product carousels, slideshows and collection banners will add to the visual impact of the theme. Easy-to-use sorting options and Ajax Cart will ensure your customers’ satisfaction with shopping, and they also will be able to use multiple sharing options on your website. Contact Form and Newsletter Subscription can be used to maintain a constant connection of people with your store. This gleaming theme is connected with Apple products, such as iPhones, MacBooks, iWatches, and so on. Effective product arrangement into collections and catalogs will guarantee the easiness of finding any required objects. Stunning galleries will illustrate products’ features, and your blog will inform people of the latest tendencies or new arrivals. Parallax effect included in the theme will also mesmerize your clients. Having a pleasant look and efficient design, this theme provides you with three various homepages to create an electronics website. Apply various shop layouts, include a blog, your company’s information and your contact details for people’s use. It’s up to you to emphasize products with the help of carousels or slideshows, adding banners, quick views, reviews, and numerous other important parts. Unique header style, Mega Menu with images, supporting multiple currencies are some of the additional charming features of this theme. 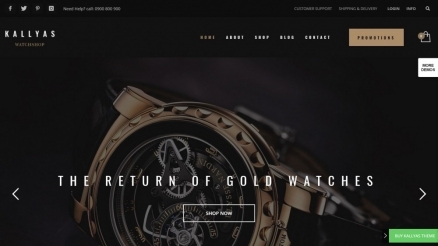 Ideal for creating a website that deals with electronic watches, this theme is fully loaded with functionality. Present your collections in lists, add images to the text, arrange information in columns – you’re free to experiment with your page look. Collection Tabs, Ajax Cart, Search Form, and Product Quick View are only some of the features that lead to customers’ satisfaction. What’s more, this theme includes Instagram Feed, so you can advance your products sales via one of the most popular social networks. To conclude, launching your personalized online store that sells electronics products will be as easy as ABC with Electronics Shopify themes. Developed by professionals, these themes take into account everything an online store may need. They are empowered with multiple features that contribute to clients’ satisfaction, such as efficient Search Form, various Sorting Options, product tags, and Quick View, a user-friendly cart, as well as Countdowns and Testimonials. The themes also let you adjust your website to your needs by changing colors or choosing from a variety of Google Fonts. Choose the theme you like most and start your online store!